I received a helpful push from Paul Evans this evening. He reminded me that the Semantic Workbench SourceForge project (semanticwb.sourceforge.net) is just sitting idle, waiting to be kicked-off. We talked about the vision around the project, which needs to be clearly and concisely articulated as a mission. At that point we’ll have a direction to take. This conversation coincided with my attendance at two semantic-web presentations at Oracle OpenWorld, which I am able to attend since it is co-located with JavaOne. I’ll write more about my experiences at this year’s JavaOne conference soon. These semantic -web presentations validated the value of semantic technologies and the need to make them more visible to the IT community. For my part, this means I need to do more writing and presenting about semantic technologies while creating a renewed vigor around the Semantic Workbench project. As Paul and I spoke and I tried to define my vision around the project, I realized that I was being too wordy for a mission statement. The fundamentals of my depiction were also different from the current project overview on SourceForge. The overview does not describe the truly useful application that I would like to see come out of the project. 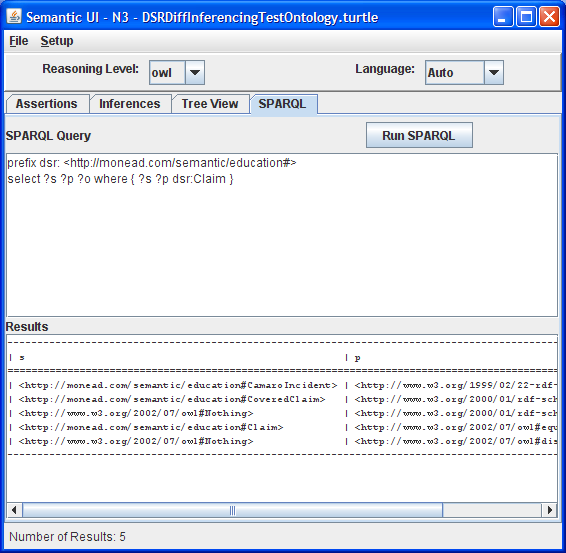 The Semantic Workbench strives to provide a complete Java-based GUI and tool set for exploring, testing, and validating common semantic web-based operations. As a way to work with semantic web concepts, including asserting triples, seeing the resulting inferences and also leveraging SPARQL, I have needed a GUI. 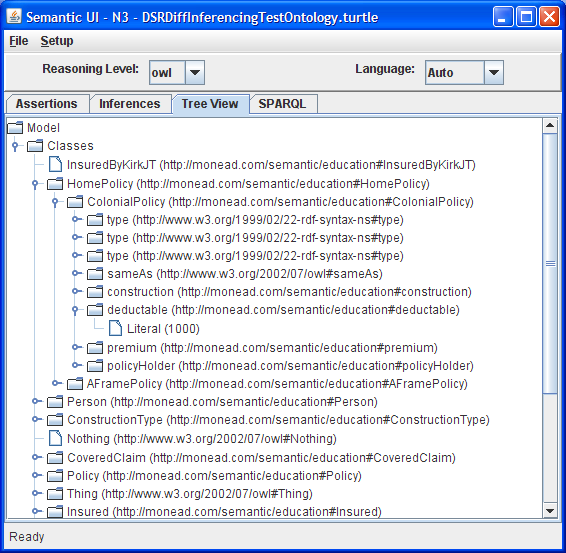 In this post I’ll describe a very basic tool that I have created and released that allows a user to interact with a semantic model. Here are some screen shots of the application. Explanations of the tabs are then provided. Initial View: Appearance at startup. The reasoner cannot be run until there is text in the assertions text area. 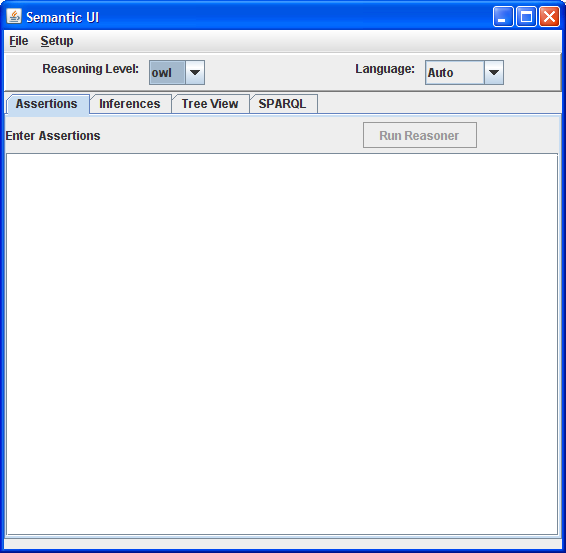 Assertions Tab Populated: The assertions tab is shown populated. The Run Reasoner button is then used to run the reasoner and create an in-memory model that can be saved to disk or explored using SPARQL. Inferences Tab: Once the reasoner has been run successfully (e.g. 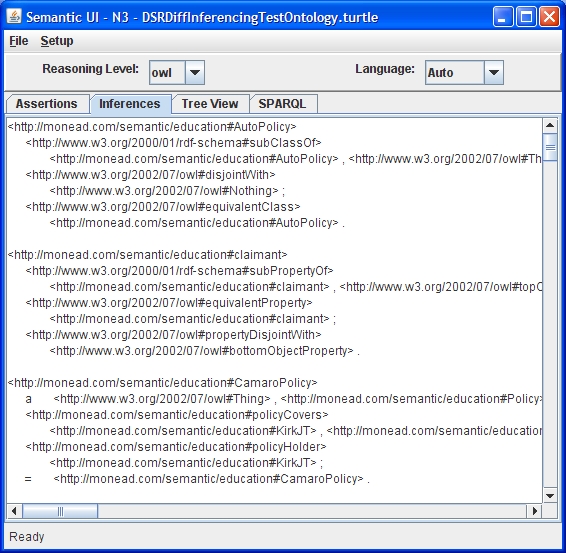 legal set of assertons entered on the Assertions tab and the Run Reasoner button used), any inferences will be displayed on this tab. Tree View Tab: Once the reasoner has been run successfully (e.g. 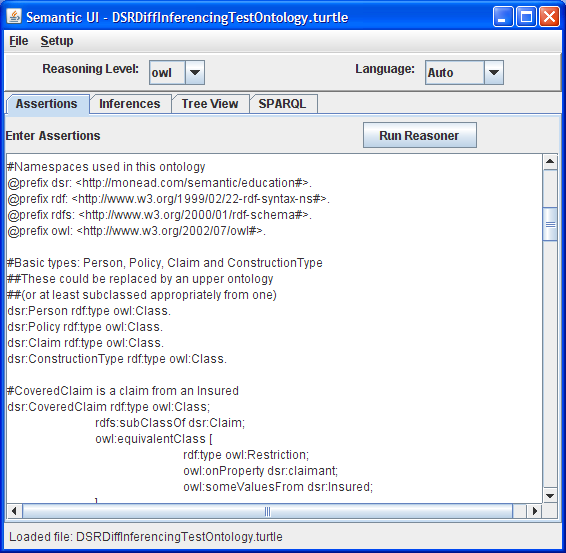 legal set of assertons entered on the Assertions tab and the Run Reasoner button used), the model (asserted and inferred) will be shown as a tree structure based on class. The program provides each feature in a very basic way. On the Assertions tab a text area is used for entering assertions. The user may also load a text file containing assertions using the File|Open menu item. Once the assertions are entered, a button is enabled that allows the reasoner to process the assertions. The reasoner level is controlled by the user from a drop down.